A certain level of discards of blood and blood products is both inevitable and appropriate to ensure that products are available where and when they are clinically necessary. However, there is a proportion of discards of blood and blood products that is neither inevitable nor appropriate which is defined as wastage. The National Blood and Blood Product Wastage Reduction Strategy 2013-17 (the Strategy) has been developed by the National Blood Authority (NBA) to reduce the unnecessary wastage of blood and blood products. Minimisation of the wastage of blood and blood products is a key requirement of the Statement of National Stewardship Expectations for the Supply of Blood and Blood Products , endorsed by Australian Health Ministers in November 2010, and National Safety and Quality Health Service (NSQHS) Standard (Standard 7, Blood and Blood Products) . As part of this Strategy from May 2013 all blood components supplied by the Australian Red Cross Blood Service included a cost indicator printed on the blood bag label. More information on this issue is here . Shadow discard target rates have been established for red blood cells, platelets, clinical fresh frozen plasma and cryoprecipitate. Many health providers access the targets from BloodNet  reports and use them to benchmark their wastage rates at a peer, state and national level. The NBA has developed a number of tools to assist health providers in implementing better practice processes associated with good inventory management practices such as ordering, receipt, storing, handling and issuing of blood products. The NBA has continued to develop collaborative networks across the blood sector to ensure the widespread adoption and successful implementation of wastage reduction measures. Wastage Summits have been held in two jurisdictions and an award program is in place to identify and acknowledge excellence. A new interactive site called The Conversation  has been launched where the NBA and the community can interact with surveys, feedback, stories, public consultation, brainstorming and much more. Identifying key contributory factors to unnecessary wastage is a high priority, with specific proposals to be developed to address systemic issues. The NBA has produced tools to assist with the transfer of product between providers including Managing Blood and Blood Product Transfers  and the BloodNet Blood Fridges Module  to improve health provider confidence with product cold chain integrity and a Better Practice Case Study  on converting unused thawed clinical fresh frozen plasma to extended life plasma, thus reducing its wastage rates. The NBA is always interested in hearing your suggestions and ideas. A targeted range of wastage reduction promotional material  have been developed by the NBA including swing-tags for blood bags, posters, magnets, pens and intra-hospital transfer cooler bags aimed at clinical staff. The promotional material is utilised by laboratory staff, transfusion nurses and clinical champions to move the discussion of blood and blood product wastage from the laboratory to clinical areas such as wards or operating theatres. A range of reports have been made available for health providers on BloodNet  allowing them to monitor blood orders, issues, transfers (including age at transfer) and wastage down to the ABO group and discard site. The reports provide the discards as a percentage of issues rates for the facility, similar sites, state and nationally as well as benchmark targets. 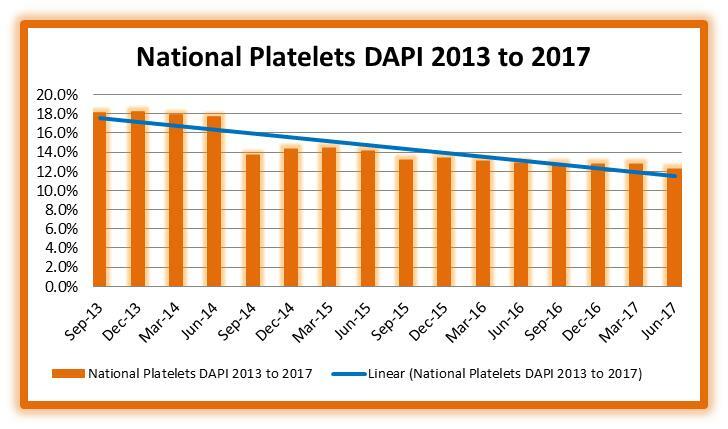 These graphs provide a snapshot of quarterly national red blood cells and platelets wastage in Australia over time. While hard work is reducing the wastage rate, the 2014/2015 financial year saw approximately 26,000 voluntary donations discarded. 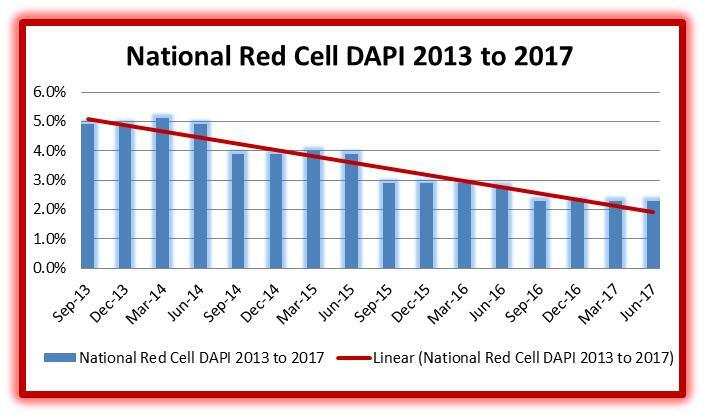 The graphs show the rate of Discards as a Percentage of Issues (DAPI).